Hey, what song is that? SoundHound makes it simple to identify music playing around you. Whether you’re in the car or out and about — open the app, hit the big orange SoundHound button, let your phone listen for a few seconds, and we’ll tell you exactly what’s playing! 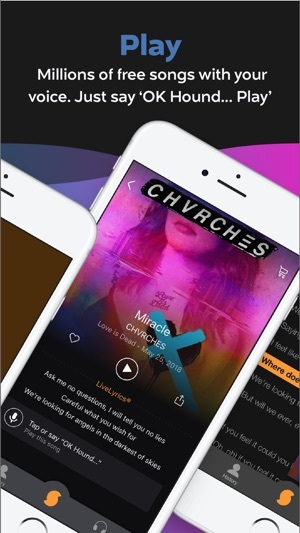 It's been called pure magic — and with 300M+ downloads and billions of songs discovered — we tend to agree. SoundHound comes equipped with “OK Hound…”, an incredibly powerful way to interact with the app using your voice. “OK Hound…” can help you navigate the app, activate the orange button, and playback songs hands-free. Simply say ‘OK Hound...’ from any screen and say a command! Discovering new music is only half the fun of SoundHound. We’re music lovers too, so we’ve created an incredible experience for you to relive your discoveries with our music player. 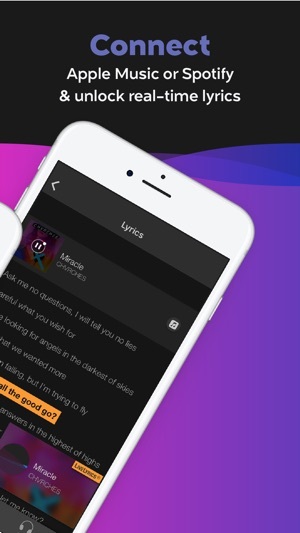 Connect your Apple Music or Spotify account to listen, build playlists, explore music across genres, and find new favorites - all with real-time, karaoke-style lyrics using LiveLyrics®. Don’t have an Apple Music or Spotify subscription? No sweat, we have you covered with our free, built-in YouTube player. This is your music journey. Curious to know more? Here’s everything you need to know! • Tap the SoundHound button in the app, in the notification center widget, or via 3D touch on the app icon to discover music playing around you! We’ll let you know everything about the song including title, artist, album, and lyrics! • Have a song stuck in your head? Press the SoundHound button, sing or hum the tune, and we’ll do the rest! • Share your music discoveries to Facebook, Twitter, messaging services, and email! 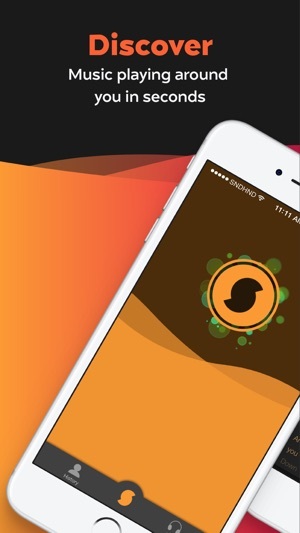 SoundHound is powered by Houndify, an independent voice-enabled AI platform that enables natural, conversational intelligences on any product. LOVE this app. I use it all the time both for trying to remember a song I knew but forgot the artist or a new song that catches my ear. I have been a SoundHound users since what feels like the beginning. They have proven to be consistent and reliable. Which is quick and accurate results. One of the main reasons I love SoundHound is for the feature that no other app features. Which is live lyrics! That is by far one of the coolest most useful things about SoundHound! Being able to sing along (rather badly) with either a fav song or even a new song im obsessed with learning the lyrics to, the app is there for me :). SoundHound I felt has always tried to give the user what they want. Realizing its difficult to please everyone, I for one have been a very happy and satisfied customer since its launch. I tried the "other" guys and they were just too commercial for me. SoundHound was the right balance of finding new music without pushing the sales-y part of the music industry onto me. I love it for its accuracy, its fast results, and giving me MORE if I chose to know more. Its all there. Keep up the good work guys! Thank you for your review! Happy to hear you've enjoyed using SoundHound. If you have any additional feedback to share in the future, please don't hesitate to let us know! Return User - Excellent App! So, my wife and I are music fiends; grew up on it, love most genres - well, except country but that’s for personal reasons no room to explain - whenever a song is played on a tv show or movie - or anywhere really - that catches our attention, we love to use our phones to find out who the artist is and song name. Well, we once used this app years ago; but as apps and space became an issue it sadly went away. Mainly because hey, “Siri has the same feature right?” Let me tell you this people: Siri has digressed in many ways since it’s period of amazing us. When Siri continues to take FOREVER to reply to the simple request of identifying the song - no, this is not a WiFi or network issue as most of you will agree - the song is OVER or the cutscene where the song is used is long gone and Siri still is identifying....well, we’ve had enough. This app is great, always has been. We are happy with its features and will NOT be using “you know who” for those requests anymore...or most other things these days...but that’s a different story. Great app keep up the good work developers! I LOVE Soundhound❣️ My husband introduced it to me about a year ago and I have used it to see who the artist of a song is, to see the lyrics on a song playing on the radio or my favorite TV Station “ Contemporary Christian Music”. It keeps a song I love on a playlist and can go back and listen to it again anytime I want to. There are so many things you can do and/or find out about a song, an artist, search for a song even if you only know part of the lyrics and it will 9out of 10 times find the name of the song and artist, I could go on and on about SoundHound it is my all time FAVORITE APP of all the millions you can get!